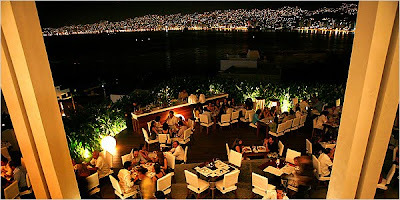 Anyway luvs, here's where I went to dinner last night, it's THE HOT spot in Acapulco right now and it definitely is a place to remember. The Ultra-Trendy Becco al Mare. Guys, it's I-N-S-A-N-I-T-Y. The New York Times published an article about it and these pictures and words below are from the article which can be found HERE. 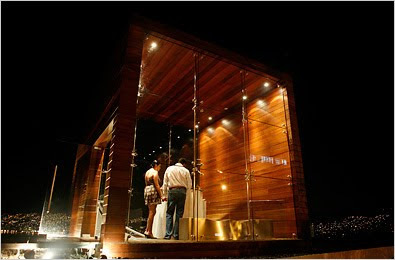 "Perched high above the tourism mayhem, a stark wood-and-glass pavilion offered an escape hatch from the city’s clichés. Inside, a sparkling white restaurant opened up like a giant flashbulb onto the glittering coastline beyond, with house music throbbing to the clinking of wineglasses and the clattering of stilettos on polished concrete floors. A crowd of young Mexicans in open-collar Gucci shirts and fluttering Pucci dresses circulated about, perhaps hoping to catch a glimpse of the actress Tara Reid, the singer Luis Miguel and the other boldfaced names who had been spotted there recently. “It’s fantastic, no?” said Angelo Pavia, the owner of the restaurant Becco al Mare, marveling at his own creation as he swooped his hand across the soaring space for emphasis. Acapulco is having its second act, reappearing from the fanny pack-strewn beaches to recapture its faded Hollywood glory. Between the new luxury condominiums rising in Diamond Point and the vintage modernist villas in Las Brisas, a necklace of sleek new restaurants, fashionable nightclubs and designer hotels is drawing the glitterati back to the city’s azure shores. Even legendary resorts are getting a makeover, like old movie stars staging a comeback. 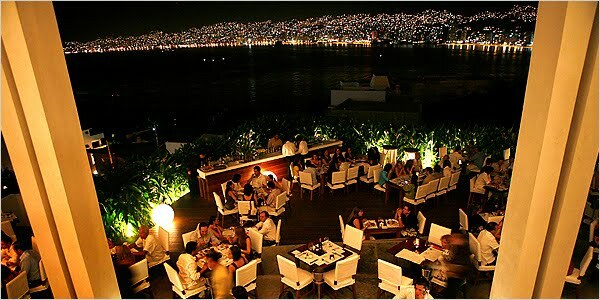 One thing that remains unchanged, however, is Acapulco’s natural beauty. Hugging the calm, crystal-blue waters of Acapulco Bay, the city cascades from the Sierra Madre, forming a yawning, near-perfect crescent ringed by rocky cliffs, palm-feathered slopes and miles of powdery golden sand. And it was this striking topography, along with the dependably flawless weather, that once made Acapulco an unrivaled playground for the 20th-century beau monde. At its peak, Acapulco was a haunt of Frank Sinatra and the Rat Pack, where Elizabeth Taylor married Mike Todd (the third of her eight weddings), and John and Jacqueline Kennedy headed for their honeymoon (as did a young Bill and Hillary Clinton). Howard Hughes spent his last days at the Acapulco Princess hotel. Lana Turner had a place overlooking the water, as did John Wayne. 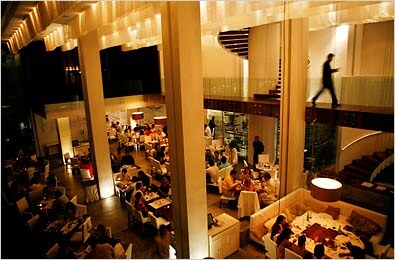 “Fun in Acapulco” was not just a 1963 film starring a dashing Elvis Presley but an international shorthand for glamour. “The world’s first discos were in Acapulco,” said Esteban Matiz, a fashion designer and lifelong Acapulqueño, who remembers many of them well. Indeed, in 1967, a Life magazine cover article proclaimed Acapulco the “Top Jet Resort” and “one of the most sophisticated and pace-setting” spots in the world. " It looks absolutely lovely there! I hope you have an amazing time! It looks gorgeous! Hope you enjoy your time! Such a gorgeous hotel! Glad you're having a good time! Have a great time- The photos look lovely and I want to see some shots of the beaches too!